I sometimes wonder if my ancestor’s experience was the same as other people’s. I’ve written before about how my family tree is made up of new immigrants. There are no pilgrims, Puritans, or Revolutionary War heroes in my tree–so far. My first immigrant ancestor didn’t arrive on the scene until the 1840s. Who Fills Your Family Tree? What about your family tree? Were you’re ancestors members of Native American tribes or Native Hawaiians? Were they one of the first Europeans to arrive on America’s shores? Did they come in the 1800s or after 1900 looking for employment opportunities or to escape oppression? Here’s an exercise. Get your pedigree chart. Then, count the number of immigrant ancestors that you have. What number did you come up with? How Many Immigrant Ancestors are in My Family Tree? This pedigree represents the first few generations of my tree. Click on it for a larger view. I’ve marked the immigrants to America with an asterisk. Here is a list of my immigrant ancestors. Yes, there are enough to make a list. In all, I have 17 immigrant ancestors. It may have been easier to count the first people in my tree who aren’t immigrants. That’s easy! Not counting my parents, these are the only ancestors I have that were born in America. All three of them. What Number Did You Come Up With? I wonder how my numbers compares to others. How many people have 10 to 20 immigrant ancestors? How many only have 2? A lot will depend how far back you have to go to find your immigrant ancestors or how near. If your parents are your immigrant ancestors, then your number is going to be two no matter how you slice it. You may have that one person who arrived in 1920 and the three others in the 1750s. I’ve located some of the ship records for my immigrant ancestors. It’s interesting to find the passenger list and see your people listed. If you’re interested in a better understanding of ship records, “They Came in Ships” by John P. Colletta is a good place to start. Did your immigrant ancestor came as a child or as an adult. Were they single or married? Did they marry another immigrant or someone who was born in America? 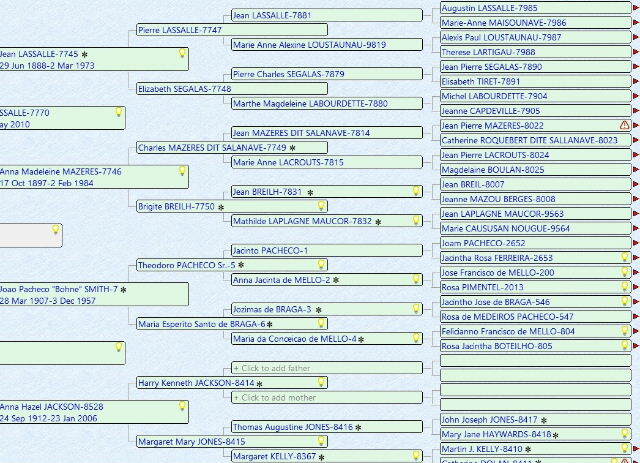 It is interesting to see how many immigrant ancestors I have in my tree. The 17 represent six countries. That’s a lot of trails to follow across the world and a lot of people to come together in California where I was born. If anyone of these people decided to jump ship in South America, who knows what my story would be! Lee, I’m not completely familiar with this area of research. I’ve only had to deal with one case of orphans in San Francisco. It was a temporary situation after the earthquake and I knew who the birth parents were. I wrote a post about that research here: http://www.researchjournal.yourislandroutes.com/2010/06/san-francisco-record-of-orphans/ You might also check out the sfgenealogy.com website to see if they have any tips.